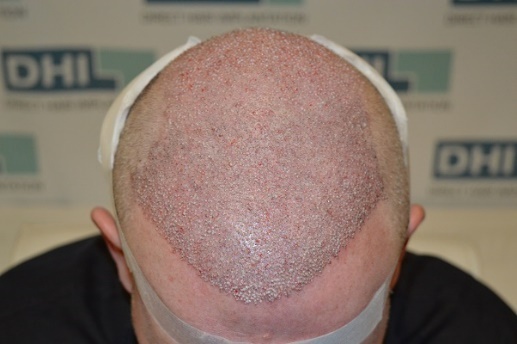 12,000 plus follicles implanted for a complete transformation, in just 11 hours! 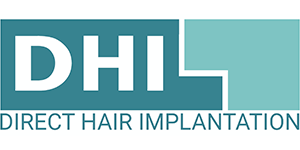 The master surgeons at DHI International are just that…’masters’ of hair restoration! Another master surgeon achieved this amazing feat by performing a hair transplant procedure of 12,086 follicles in merely 11 hours with awesome results. 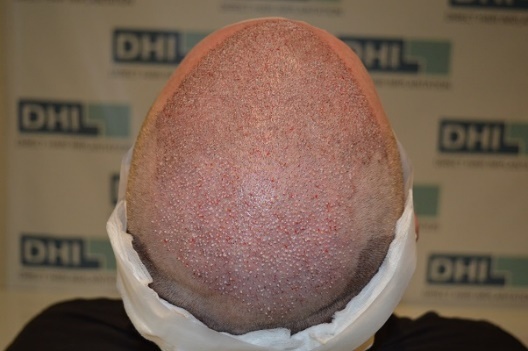 A 48-year-old Caucasian male patient suffering from grade 5 Androgenetic Alopecia visited a DHI clinic. He had very few hairs with density of only 10 hairs on an average per square cm. He used to apply a lot of gel and kept his hair very long, to try to cover parts of his scalp. But obviously he was not happy with the old look that it gave him. The good news was that he had a good donor area at the back of the scalp and most his grants had 2 follicles in each unit. A precise mathematical count was done of the available hairs in the donor area using an advanced diagnostic system. The master surgeon created a very natural looking hairline with target to give him density on his entire scalp. A carefully designed, record breaking and ambitious treatment plan was crafted to implant 12,000 hairs within one session, spread across two consecutive days, in just 11 hours of procedure, including short lunch breaks on the two days. The patient arrived at the clinic at 10 am next day and after some preparation, the procedure started at 11 am. Extraction process was done using DHI’s specially designed, titanium-tipped sharp, single use, disposable punches. 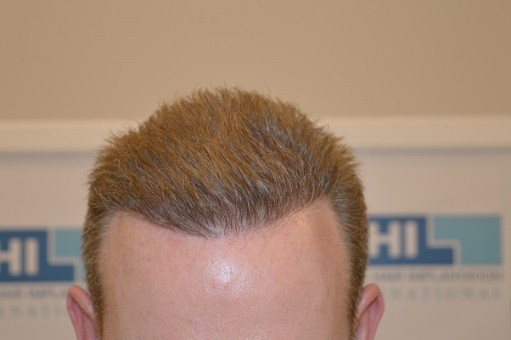 Within 3 hours, the DHI Master Surgeon extracted 2828 grafts and a total hair count of 6,832 at a graft ratio of 2.4. After a light lunch break, implantation was done in Zone A of the scalp using the DHI patented implanter, at an Average Density Target (‘ADT’) of 70-75 hair per square centimetres. Zone B was then partially covered at an ADT of 40-45 per square centimetres. The entire implantation process on the first day took only 3 hours. The patient went back and had a comfortable sleep overnight. He arrived the next day when the procedure resumed on the remaining area of the scalp in Zone B and Zone C. The extraction of 2,245 grafts and 5,254 hairs was performed in lesser time of 2 hours 30 minutes and implantation was continued for Zone B and Zone C at an average density of 40-45 per square centimetres in 2 hours 45 minutes. The entire procedure of 5,073 grafts, translating to a total hair count of 12,086, took about 11 hours. 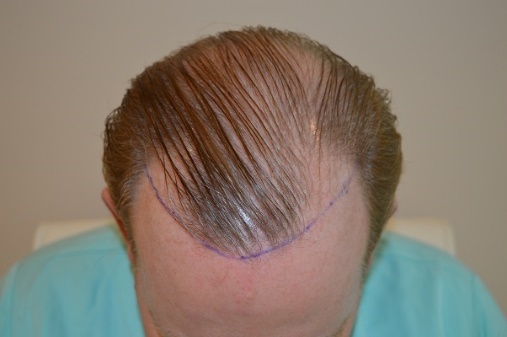 The full result of a hair transplant takes around 12-18 months. However, the patient is delighted to see the result that is visible within 5 months! Here is the result currently. More than 95% of the implanted follicles are showing healthy growth. We expect the hair growth cycle to fully show result in the next 3-4 months. A life transforming change! The patient is a CEO of a large company and can’t stop blushing with all the compliments he is getting on his new look! This feat is only possible at DHI International where hair transplants are performed under strict protocols, with patented single use instruments by master surgeons who are highly trained and skilled. Click here to Book your consultation with our expert doctors. Our specialists will be glad to assist you and answer to your questions. © 2017. All rights reserved by dhiindia.com.